Why Is Technology Important for Dental Implant Placement? Dental implants are the gold standard when it comes to replacing missing teeth. They provide benefits that other prosthetics do not, such as remarkable longevity and the prevention of bone loss. They also look and feel natural. Really, anyone who suffers from a gap or two in their mouth should look into receiving a dental implant in 43725. But before you leap into the implant process, you might like to understand a bit more about the technology that will help to restore your smile. A lot goes into determining whether you are a candidate for dental implants. Not only will your oral surgeon talk to you about your oral and overall health, but you’ll have to undergo a few diagnostic procedures to make sure your body will handle the procedure well. That’s where advanced imaging technology comes in. Digital X-rays are a good starting point because they let your dentist get a look at your jawbone and teeth. It’s a fast process that exposes you to as little radiation as possible. 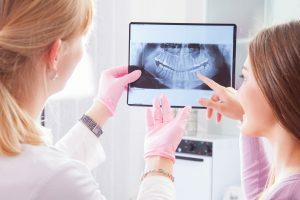 Beyond X-rays, your dentist may use an advanced digital scanner that will provide detailed information about your mouth and all the structures around it. During the implant surgery, your dentist will need to know about the locations of such things as your nerves and sinuses. Knowing such information beforehand helps your surgeon prepare for your procedure. Some dentists use old-fashioned materials to make impressions of teeth, which is uncomfortable for patients and awkward for dental professionals. Digital scanners make it possible for your dentist to quickly capture a detailed 3D impression of your existing teeth. This will make sure that your new pearly whites will fit in well with your natural chompers. The images and impressions that your dentist captures will help them to plan out your surgery and choose the right materials for your treatment. Using advanced software, they can experiment with different sizes and placements for your implants. Therefore, they can ensure that your restorations will fit as well as possible and have an improved chance of bonding with your body. Plus, the software can also give you and your dentist an idea of what your smile will look like when all is said and done. You’ll have something amazing to look forward to! Of course, your dentist’s cool techy toys won’t do all the work themselves. Your oral surgeon is a highly trained professional with years of experience in placing dental implants. The combination of modern technology and a skilled hand will ensure that your implant journey goes as smoothly as possible. Would you like to learn more about the technology behind successful implant surgeries? Your dentist would be happy to educate you! Dr. Jeff Lee has been helping to restore people’s smiles for over a decade, but he doesn’t rest on his laurels. He is always looking to use the latest and best advancements in dental technology to help his patients. If you’re thinking about getting dental implants, please contact our Cambridge location at 740-432-8768. Comments Off on Why Is Technology Important for Dental Implant Placement?